BEFORE their crushing victory over the Golden State Warriors in game five in Oakland, the Cleveland Cavaliers were a ridiculous $17 to win the NBA title. 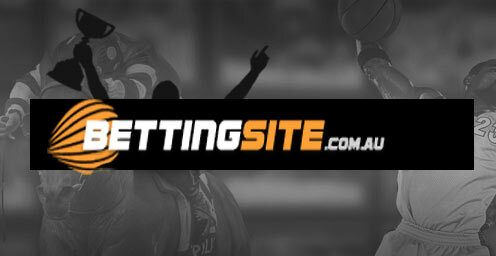 But those who took a bite of that considerable cherry with sportsbet.com.au will have broken a wry smile after Lebron James and Kyrie Irving became the first duo to ever combine for 40 points in the same NBA Finals game. And now the Cavs are the favourite town game six in Cleveland and had their title odds drastic slashed to $4.75 with the online bookmaker. It was always going to take a remarkable effort to stop the Warriors taking the title on their home floor after their huge win over the Cavs in Cleveland in game four gave them a 3-1 series lead. Enter The King and his apprentice. James had a monstrous 41 points to go with 16 rebounds, seven assists, three steals and three blocks, draining four three pointers, in one of the great finals elimination game performances. Not to be outdone, his team mate Irving also poured in 41 points with five treys to go with six assists in a dominant duopoly that led the Cavs home. Tristan Thompson – like he has been all series – was a monster on the glass, ripping down 15 rebounds and JR Smith had 10. It was like the Cavs played with four men for 33 minutes of the game, big man Kevin Love scoring just two points to go with three rebounds. The Warriors led at the half with Splash Brother Klay Thompson cooking, but it was the third term where the Cavs won this one. Thompson finished with 37 points, splashing six three pointers, while his Most Valuable Player team mate Curry was unable to back up his game five performance, scoring just the 25 points with five three pointers – five points below his season average. The Warriors were hurt by the suspension of gun all rounder Draymond Green, who incurred the NBA’s wrath after Lebron dobbed him in for an apparent groin shot. Andre Iguodala stepped up in his absence with 15 points, 11 rebounds and six assists, but the game was marred by an ugly injury to Aussie big man Andrew Bogut. While it is not yet clear just how bad his knee injury is, Bogut would have to be in doubt for game 6. If that happens, the Warriors will produce yet another new look for the Cavs, with Green coming in. Will they play that small ball line up with Draymond at the five and Iggy starting? Time will tell. As far as NBA Finals go, this series is about as hard to predict as any. Every one thought the Warriors were going to do this easily. And at times they have. But as soon as they have gained the ascendancy, the Cavaliers have wrenched it right back. The Warriors beat them in game one and slaughtered them in game two, leaving people with visions of a sweep. But the Cavs bounced back at home with a 30 point win. Then the Warriors came back and took a win on the road to leave them within one victory of back to back titles. Against the wall, the Cavs brought the goods to make it 3-2. But can they sustain it? We think they can. 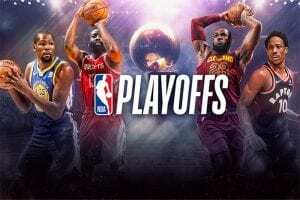 Lebron and Kyrie now know they can tear this team apart and, should they do the same again on their home floor, the Cavs will win and win well, because you can expect the role player will play better in more familiar surroundings, with the crowd on their side. Most of the games have featured big margins and we don’t think this one will be any different. We are predicting the Cavs to get home by a huge margin, sending the series to a decisive game six. It will be up to Curry to snap out of the funk that has plagued him in all but one of the games this series, and his Super Splash Brother Thompson to fire them up. We reckon Green will be on a mission too, but this series has a seven game epic written all over it. The two teams covered the score spread thanks to the remarkable offensive outburst from James and Kyrie, but we feel like this one goes the unders, with the Warriors set to struggle in Ohio. 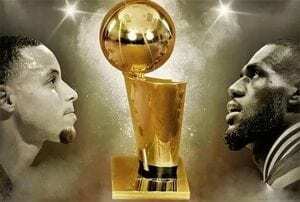 NBA Finals Game 2 betting guide – can Lebron bounce back? 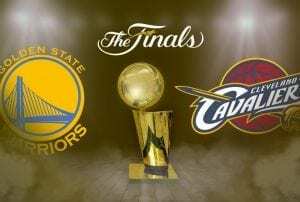 2015 NBA Finals series Cleveland vs. Golden State – who will win?